Everyone needs a relaxing place outdoors to escape to; their little haven, a safe space. It can be difficult to find a quiet and lonely space, nevertheless in the big city. In those cases, you learn to take any small outdoor space you can find. But a fire escape isn’t exactly a private outdoor space, so if you’re looking for a charming place to call home while also giving you a nature escape, then we’ve rounded up some of the up-and-coming NYC properties giving you the best of both worlds. Ensconced in its own private park-like oasis, Gramercy Square offers effortless luxury in Manhattan’s coveted Gramercy Park neighborhood. Four architecturally distinct buildings, each with its own unique design perspective, are interconnected through extensive landscaping, a breathtaking central garden and richly inspired amenities level. Designed for both quiet enjoyment and stylish entertaining by award-winning landscape architect M. Paul Friedberg & Partners, the heart of Gramercy Square is 20,000 SF of private gardens which foster a meaningful interplay between landscape and architecture. The private courtyard garden features convivial seating, and fully-equipped outdoor kitchen, shaded walks, and beds of vibrant perennials. A handsomely detailed solarium connects to the extraordinary Gramercy Club. The Chamberlain, recognized for some of the most significant residential and hospitality commissions in the world, Alexandra Champalimaud’s interiors for The Chamberlain enhance FXFOWLE’s sophisticated layouts creating a memorable sense of place, inspired by the character of the Upper West Side and adjacent Riverside Park. The Garden Courtyard seamlessly integrates The Chamberlain’s indoor and outdoor amenities. The landscaping, including the living green wall, features a mix of evergreen and seasonal plantings, creating a continuously evolving, colorful backdrop. The front bed of the green wall will be changed seasonally to represent the beauty of nature throughout the year. For the Spring season, the wall will be comprised of a lovely arrangement of Azaleas and Hydrangeas. 25 Park Row, the COOKFOX Architects designed tower rising 50 stories at the previous site of J&R Music World, embraces biophilic design and a connection to the neighboring City Hall Park, which can be seen from all 110 residences! Uniquely, over 98% of the residences at the building have access to usable outdoor space ranging from terraces, balconies, and loggias to support residents' health and well-being and offer a connection to the outdoors. These private spaces feature views ranging from the Woolworth Building to One World Trade Center to rivers and beyond! 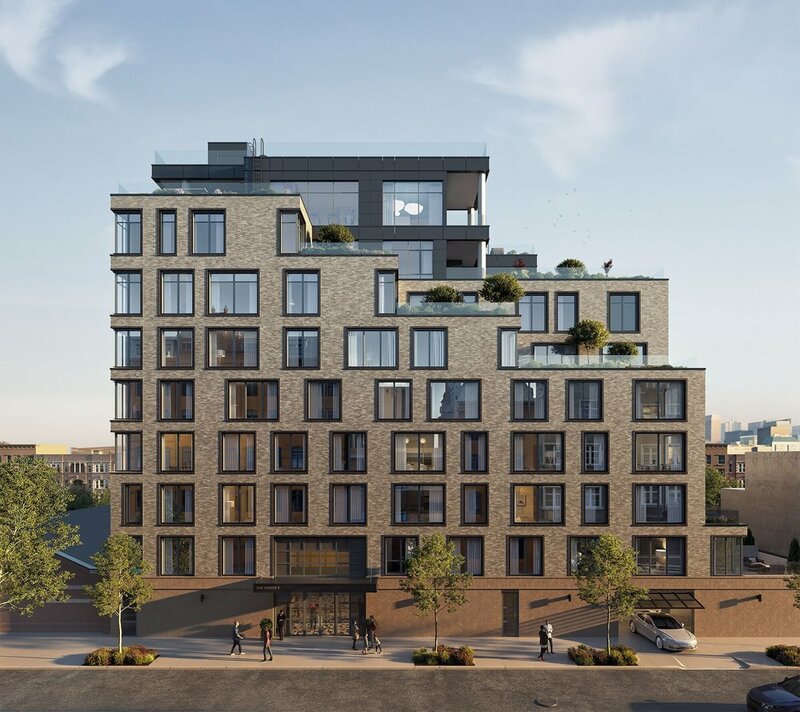 200 East 21st Street is a condominium building in the Gramercy neighborhood, by Alfa Development with exterior designed by BKSK and interiors by Champalimaud Design. 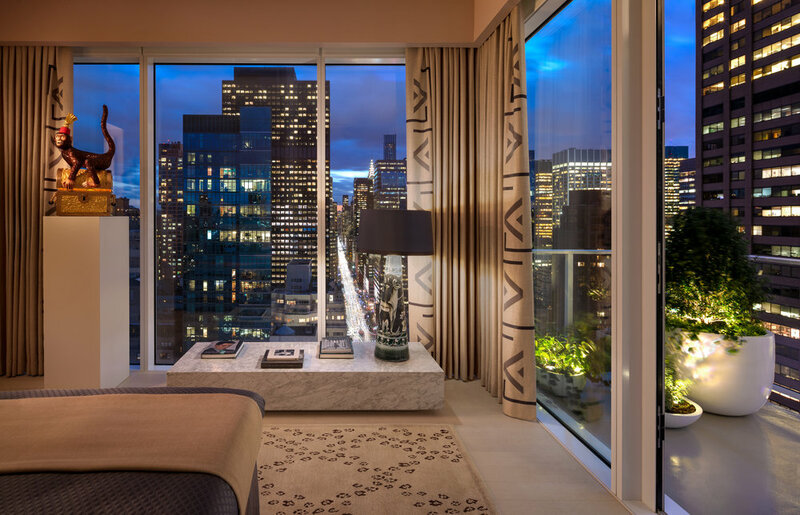 Select residences feature outdoor terraces that offer views of Gramercy Park, Madison Square Park and the clocktower. Opportunities for wellness abound, as carefully conceived indoor and outdoor spaces create a holistically enriched living experience and integrated planted rooftop lounge designed by Halsted Welles Associates featuring lush and native adaptive plantings and meandering stone pathways for a peaceful retreat from the excitement of the city. 130 William is Sir David Adjaye's first skyscraper, as well as his first high-rise tower in NYC. Recognized as one of the leading architects of his generation, Adjaye was recently knighted by Queen Elizabeth II and named one of TIME magazine’s 100 most influential people of 2017. The design for the tower, which is being developed by Lightstone, features masonry architecture and a unique silhouette of rhythmic, large-scale arched windows. The top 10 residential floors are home to the Penthouse and Loggia Residences, which offer expansive outdoor spaces with unprecedented views, including the Brooklyn Bridge, Manhattan Bridge, the Statue of Liberty, the Woolworth Building, City Hall Park, the East River, One World Trade and the Empire State Building. The Loggia terraces wrap these residences from end to end, providing significant outdoor space starting at over 600' in the air. 565 Broome SoHo is a luxury condominium with architecture by world-renowned firm Renzo Piano Building Workshop (RPBW) and interiors by Parisian firm Rena Dumas Architecture Interieure (RDAI). 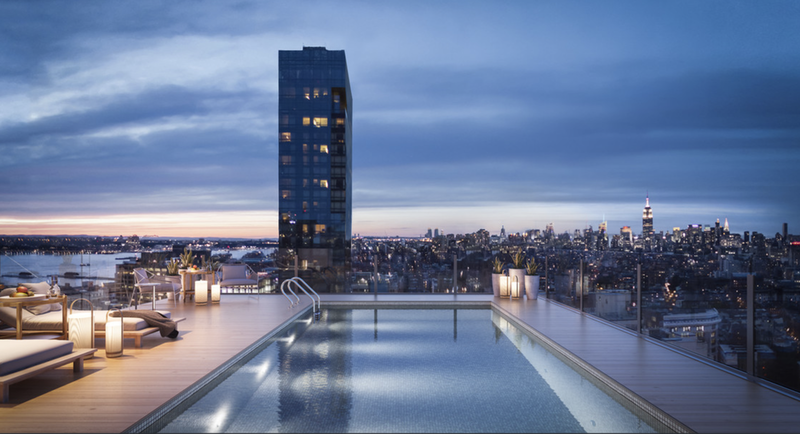 It's the first residential building in NYC designed by Pritzker Prize-winning architect Renzo Piano, named by Time magazine as one of the top 100 most influential people in the world.565 Broome SoHo, features 115 residences. The Penthouse feature large open living spaces with incredible light and views through floor-to-ceiling windows, custom eat-in kitchens, radiant heated floors in the master bathroom, and generous outdoor space allowing for seamless extensions of living, dining, and entertainment areas including a private roof terrace with a 20’ heated outdoor pool with views of midtown Manhattan, the Empire State Building, and Hudson river. This Williamsburg condominium offers a modern, new take on a garden unit with terrace space that rivals any suburban backyard. Located on both the ground and second floors, these 10 residences are landscaped to perfection and offer extra square footage for entertaining and barbecuing. With deep wraparound terraces spanning each of the tower’s 35 floors, this luxury skyscraper developed by Macklowe - the visionary behind 432 Park Avenue - integrates indoor/outdoor living space as though it were a condo in Palm Beach. The penthouse terraces are as large as 3,471 square feet, which to put it in perspective, is almost 1,000 square feet larger than the median size of a completed single-family home in America.